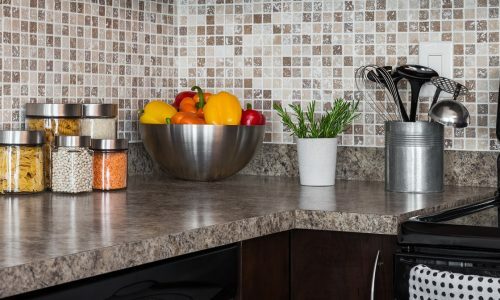 With new materials such quartz worktops and sintered stone flooding the market, many of our customers are struggling to figure out whether these newcomers measure up against traditional, natural stones such as marble and granite. The short answer is that yes, they do. Engineered stones like Caesarstone have many outstanding qualities and are an excellent choice for kitchen worktops. However, they do differ from natural stones in key ways, so the answer to the question ‘which is best?’ is always going to be ‘it depends!’ Read on to find out how the two stones differ. If you need more help making the right choice for your project, please contact us directly. What’s the difference between Caesarstone and granite? The fundamental difference between Caesarstone and granite is that Caesarstone is an engineered stone made from processed quartz and granite is a natural stone. This means that although Caesarstone is made from up to 93% quartz, which is itself a natural stone, it also contains some resins, dyes and bonding agents which hold the quartz particles together. Granite is formed in the earth’s crust over thousands of years and hewn out in lumps from quarries then cut to size. As a natural stone, granite is available in exactly and only the colours that nature allows. There are far more shades of granite than most people imagine as minerals in the rock can dye it red, green, or even a subtle purple during its formation. Caesarstone is a manufactured stone product, which means that its colour selection is limited only by imagination and market desire – new colours and textures are brought out every year. Caesarstone shades tend to be inspired by natural rock though, so don’t expect fire engine red or egg-yolk yellow (although other quartz companies do offer this). Granite is also more likely to vary as it’s produced by natural fluctuations. Caesarstone is designed to be consistent, which means that if you’re matching tiles or slabs over a large surface it’s much simpler to do so. Many of our customers are looking for kitchen or bathroom worktops, so health and hygiene is paramount. At Surrey Marble and Granite, we fully seal all natural stone worktops before they leave our factory, while Caesarstone is intrinsically sealed as part of the manufacturing process. This means that the two are pretty much on par in terms of health and hygiene: both are suitable for food preparation and neither will absorb liquids, smells or food particles. Both are easy to clean as spills and dirt can be wiped off with a cloth and a gentle cleaner. Quartz is one of the few substances in the world that’s as tough as granite, so the two surfaces are well matched. While we know that granite surfaces such as floors can last centuries, Caesarstone has only been around for a few decades. However, what has become clear is that Caesarstone is truly as tough as rock and both substances are incredibly hard to scratch, chip, stain or break. While we don’t have solid evidence, it does seem likely that you (or perhaps your grandkids) will get bored of your Caesarstone or granite long before either wears out. Stone worktops: is the expense is worth it?